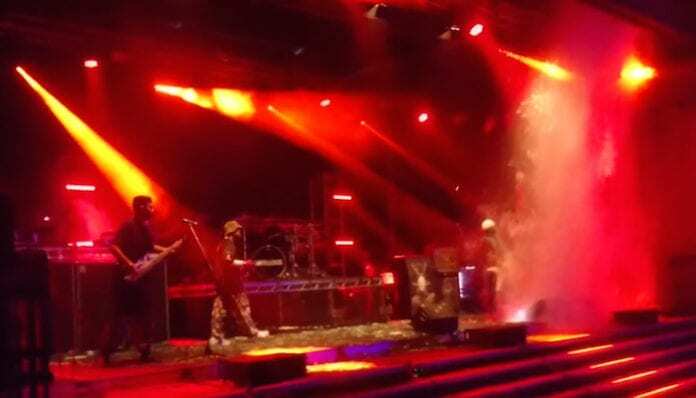 Watch Limp Bizkit's guitar gear get destroyed by water during "Break Stuff"
Guitarist Wes Borland's stage equipment gets suddenly flooded. It’s just one of those days when you’re playing a show overeseas with your early-aughties nü-metal act and a part of the roof above the stage collapses, sending a giant swell of rushing water directly onto your musical equipment. Thankfully, Borland’s been able to pick up the pieces of his soaked guitar effects pedal board. As noted by Theprp.com, he’s been working with Limp Bizkit’s guitar tech to undo some of the water damage (as seen in the below Instagram posts). But that didn’t keep frontman Fred Durst from letting out a cackle as the downpour covered his band member’s gear. Check out the falling water footage, directly below, and let us know what you think in the comments section. We fixed my pedalboard today. 2 days of letting everything dry out and massive rewiring and problem solving with @kadaver13 who is my hero right now. My looper pedal is gone and half of my power (we’re using batteries tonight) but my rig is on the way to recovery.